The word "deny" is not a word that I have ever really liked. It seems like such a negative word, a word of rejection. Recently God has led me on an adventure of discovering what the word "deny" really means. I had heard of the Daniel Fast before, but never really knew what it was nor did I care to investigate. God laid it on my heart while we were on spring break vacation to explore and commit to the Daniel Fast for a week. At the time I really wasn't sure why, but I knew I had to obey. 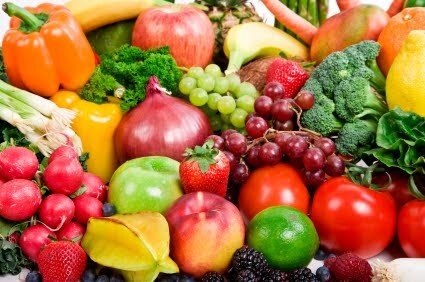 I did my research and found out that the Daniel Fast was a fruits and vegetable diet. No sugar, no meat, no dairy, no artificial sweetners, NO COKE!! The Daniel Fast is based on Daniel chapter 1 where Daniel petitions the king to eat according to his convictions and not feast at the royal table. At the end of the 10 days Daniel and his men were healthier and stronger than the ones who had feasted at the kings table. Ok, I can do this for a week!! After all if Daniel was healthier and stronger then I'm in. I really thought I would miss the coke, but I had done without coke before so I knew I could do it. I can honestly say that the coke has not been a big issue this week. I really thought God was calling me to do this in order to become healthier, but I have realized that He has been calling me to a place of learning to deny the cravings of the flesh. I don't need any comments about this, but as you can tell I do not deny myself much. If I want a coke...I drink it. If I want a pound cake...I bake it. (No I don't eat the whole thing.) If I want a chicken biscuit...Chick-fil-a has my back. If I want it I usually go and get it. I have always justified this by the fact that I don't ask for BIG stuff. (Except for the Macbook and I did have to wait a while for that.) I don't have the funds to go out and buy whatever I want when I want it, but delayed gratification is very hard for me. This week God has been bringing me to a place of understanding that denying myself is a spiritual discipline. I mean after all Christ denied himself his very life. Luke 9:23 NIV "Then he said to them all: "If anyone would come after me, he must deny himself and take up his cross daily and follow me." And right here we see that He asks us to do the very same thing. He said if anyone would come after me...(The desire of my heart is to seek after Him, so what does He ask of me)...1. deny yourself Monica 2.Take up your cross daily 3. Follow me. I have been following Him, but without denying myself. Is that possible?? And oh the crosses I have had to bear. (Yeah right!!) Have any of them caused me to give up my very life? I don't like that phrase anyway..."I guess this is just my cross to bear." This implies that my "cross to bear" is a trial or a hardship. The crucifixion was not merely a hardship or a trial, but it was death. It was an agonizing, painful death of torture. "Yet for the JOY set before Him he endured the cross." Oh how we make light of the cross when we talk about our "cross to bear." So what does Jesus mean here? How do we take up our cross and do it daily? We are daily experiencing a death. The death of the flesh. The death of the sinful man. We make a choice to deny ourselves, we make a choice to daily die to sin and flesh and to follow Him and that is where life begins. How can we have one without the other? He says if we are to come after Him then we will deny ourself, take up our cross daily and follow Him. Right now I am denying the urge to get in the car and drive to Arby's and eat a regular roast beef sandwich with fries and a coke. Is that what He wants me to deny? No, not necessarily, but He is teaching me through this fast more about what it means to deny myself. This week I am denying myself food and coke and meat and coke, but I am also learning to deny myself selfish attitudes and careless words and thoughts of pity and worry and the list goes on and on. I am learning that it does not always have to go my way and I do not have to be right and that sometimes God calls us to give up more than our flesh desires. Wow, what a journey! All of this because He called me to give up a few things for a little while. Is it worth it? To be changed eternally...YES!! "Deny, deny, deny!" 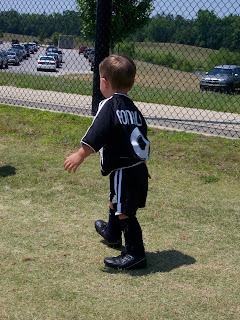 "Mommy, God made me short so I could be a good soccer player. I was not made to play football, but I was made to be a good soccer player." These words were spoken to me by my precious Joshua this morning while he was getting ready for school. Apparently this has been on his heart for a while. Joshua is small. He didn't start out that way. He came into this world at a whopping 9lbs 10oz at 22 inches long. I thought he would be a giant, but somewhere along the way God decided that Joshua needed to be small. He may not always be small. He may shoot up one day, but in the mean time God is using his size to accomplish something even greater within his heart and life. I realized this morning when he spoke those words that he knows without a doubt that God created him for a specific purpose and he is not wasting his time being something that he is not, but instead he has found his strength, he is giving God the glory for his strength and he is working whole heartedly, without distraction to use his talent. Oh how I wish we as believers could embrace this truth. Have you ever wanted to do something that you were just not gifted to do? Have you ever tried to be good at something that you were just not made to do? For years I have wanted to be a singer. I have done solos, sung in the choir, been on worship teams and I will say that I do not have an awful voice, but this is not my gift. I was not made to sing (in public). I can speak and I can teach, but sing...it just shouldn't happen, but for so many years I wanted it to be so and I forced it. I possibly even robbed others of the blessing of serving in their gifted area because I was taking up space doing something I was not called to do. I was also stifling my own gifts and talents by spending my energy on singing instead of pouring it all into teaching and speaking. God has gifted each of us with very specific gifts and talents and as Joshua said, "We were made for them." We need to seek to find those gifted places of passion and serve in those areas. God is most glorified when we are using the gifts that He has equipped us with. How defeated and embarrassing to try to be good at something that we were just not created for? I was not created to be an athlete. I flinch and squirm when a ball is thrown to me, I bat and throw like a girl and I run with my head hanging to the side. It's just not in me and it has been quite embarrassing to reveal this lack of talent before others. Now I realize that the more you work at something or practice you will get better. I was able to stay on key for the most part when singing. I have actually won a tennis game before and I have gotten better at throwing, but I will never be what you would call a gifted singer or a gifted athlete. God has gifted me in the area of communicating. (My parents knew this early on, bless their hearts.) I can stand before a room of hundreds and never have a not one butterfly. I get so excited to open God's word and teach others what He has shared with me, but hand me a microphone and start the music and I immediately start sweating and my voice starts shaking. We have gifts and we need to look for those gifts, grow those gifts and use those gifts for the glory of God the Father. I was so blessed to hear my 5 year old grasp this concept. He is a gifted soccer player. He is so gifted in fact that instead of playing with his age group 4-6 year olds, he is playing with the 6-8 year olds and he is 5. He is just gifted. He is fast, he has fancy foot work, he has accuracy in his shots and he can see the openings and opportunities as if he had a bird's eye view all the time. More importantly, he understands that God gifts us all in different ways and he is committed to using his gift and not try to be something that he is not. What an encouragement he has been to me to work in the area of my giftedness. Romans 12:6 NIV "We have different gifts, according to the grace given us." 1 Corinthians 12:4 NIV "There are different kinds of gifts, but the same Spirit." Hebrews 2:4 NIV "God also testified to it by signs, wonders and various miracles, and gifts of the Holy Spirit distributed according to his will." I use to be a homeschool mom. I miss it! God called us to put our children in public school this year. This was a very hard decision for me. Not that obeying God is a hard decision, but sometimes the things He calls us to do are hard and we have to make a choice to die to self and obey or live according to our flesh and be willing to suffer the consequences of disobedience. Matt actually heard from the Lord on this decision and asked me to graciously submit. I confess that the gracious part took a while, but I did submit. I remember the specific moment when I finally had a peace about this decision. We had "meet the teacher night" at the boys new schools and I was probably more nervous than they were and definitely more critical. After all I had been their teachers up to this point. I was having to give up control and pass the torch. More than that God was asking me to share my children. I don't like to share my children. I love them and they are mine. Well, they are His, but I absolutely LOVE to spend time with my children. So I walked into these teacher meetings with a little bit of an evil smirk and looking for reasons not to like them. (Don't judge me...I'm just being honest.) As we met with each teacher the Lord just flooded me with such a peace. 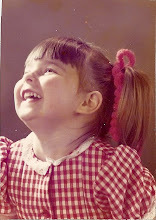 It was apparent that these teachers had been hand picked by God for my children. Matthew's teacher was very organized, very serious, but very kind and loving. Caleb's teacher was fun, he was lively and he had a section in his classroom full of balls to be played with indoors. Joshua's first year teacher was amazing. She was creative, bubbly, loving and for the icing on the cake... Joshua and his cousin Abby were in the same class. This was something we had prayed for, but had been told was not an option. God showed off. Not that He has to mind you, but He wanted to. We were blessed over and above what we could have asked for. I gave mental assent that night to the fact that maybe Matt really had heard from God on this and maybe graciously submitting was not such a bad idea. I have to tell you, although a little bit ashamed to admit it, it has taken me this long...almost 8 months into the school year to really understand why the Lord has called us to this decision. Don't get me wrong, I would call all of them home tomorrow and homeschool again just so I could have my days filled with these precious blessings, but the blessing of what I have seen in their lives this year has been much more rewarding. I can remember praying over each of these boys before they ever breathed their first breath. I can remember praying and asking the Lord above all else to give them a love for Him and for His word. I can remember praying that God would use my children for His glory, that they would be a blessing, that they would be about kingdom work and that they would have a vision within their hearts that would lift high the name of Jesus and make Him known. I have seen those prayers answered this year. Not that He wasn't answering them before, but I have seen my children being called out and set apart so that God could use them. The first week of school I heard from Caleb's teacher that every chance he had Caleb would talk about Jesus. Caleb has asked this year if he could take his Bible to school and read it to his friends during recess. (I'm not sure how he finds the time since his other objective is how many girls are chasing him during recess. The count as of yesterday was 13, but Caleb says it makes him feel like a real man, so...) Caleb, even through his comedic ways and maybe even using that as a tool, has been able to lift high the name of Jesus and share His love with these 2nd graders. Joshua's biggest downfall this year has been that he says Ma'am too much. I can handle that. I received an e-mail from his teacher the other day saying that Joshua was the kindest, gentlest child with a precious heart. What a blessing. How can I not share that? And then there is Matthew who came home from school the first week and said, "Hey mom, I'm having trouble knowing how to minister to some of the kids in my class." WOW. His teacher cannot talk about him with putting her hand on her heart and she told me the other day that he has been such a blessing to her this year. A blessing!!! Those are the last words out of my mouth as my children leave each morning..."Be a blessing today!" I know you are thinking, "My goodness, she sure does think a lot of her children an she sure does brag on them a lot." Yes I do! I want you to hear my heart and understand that it is none of my doing, but ALL the glory and honor is unto Jesus who has made the difference in their lives. I take NO credit. Jesus says that as we lift Him up, He will draw all men unto Himself. As parents that has been our goal. We just lift up Jesus and He does the rest. He has drawn these precious children unto Himself and He has placed within their hearts a vision and a desire to lift up His name. Keep in mind, they are still boys and we still have our moments throughout the day. We still have plenty of reasons to invoke discipline, but God is still having to do that with me. Imagine with me for a moment what would have happened if I had not graciously submitted. (I know, I know, but just imagine it.) The Hawkins family would have missed out on some opportunities this year to be a blessing. Now I'm not saying that revival has broken out in the Auburn City Schools as a result of my children's testimony. I know God could do that, but if one heart has been revived, if one life has been encouraged, it has been worth it. We would have missed out on the opportunity to be stretched and we would have missed out on the growth He wanted to do within our heart and lives as a family. God may call us to homeschool again. I actually hope He does, but the key for me has been listening to His voice day by day, moment by moment and then submitted to His will. In this case, Matt hearing His voice and me submitting to my husband. Graciously! What is God calling you to do today? Is He calling you to graciously submit to your husband in a certain area? Is He calling you to be obedient to Him in a certain area? Be careful that you don't rob yourself and others of a blessing by standing on your own will. Graciously submit and obey what He is calling you to do today! "Now as the church submits to Christ, so also wives should submit to their husbands in everything"
"Submit yourselves, then, to God. Resist the devil, and he will flee from you"
"Mommy, Have You Finished The Bible?" Joshua is in kindergarten and has recently learned to read. He is so excited and we are so proud. When I say he reads, I mean he really reads. He reads the title, the author, the illustrator, the title page, the dedication page and then from start to finish. At dinner the other night he said, "Hey mommy, have you finished the Bible yet?" I wasn't sure what he meant by finished so I asked "How do you mean finished?" "You know, like you have read it all and you are done with it." I explained to Joshua that it is important to read through the whole Bible and to know the whole counsel of God's Word, but that we are never finished with the Bible. "You mean you can read it over and over again?" I shared with him Psalms 119:130 NIV "The unfolding of your words gives light; it gives understanding to the simple." Joshua and I talked about how each time you open God's Word it is new and as we unfold it and study it, God uses the power of His Word to shine the light of understanding in our hearts revealing to us what He wants to teach us. "That's neat mommy, how God's Word always has something new to teach us." I agree with Joshua. It is neat. It is beyond neat. It is supernatural. It is the power of the Holy Spirit revealing God's Word that is alive and active.Hebrews 4:12 NIV "For the word of God is living and active. Sharper than any double-edged sword, it penetrates even to dividing soul and spirit, joints and marrow; it judges the thoughts and attitudes of the heart" I explained to Joshua that it is different from when you watch a movie and see something you haven't seen before or read a book and understand it differently. The Word of God is living and it is active. It is powerful and it is life changing. We can read it over and over and over again and God can use it to reveal sin, encourage passions, form visions, build testimonies, tear down strongholds, the list goes on and on. Does that not get you excited???? I got so excited explaining this to my 5 year old. I was even more excited that he understood and thought it was neat. As believers in the Lord Jesus Christ this understanding of His Word should revolutionize our lives and make us ravenous for His Word. Matthew made an interesting observation the other day. We go to school and work 5 days a week to prepare to stay in this world for a short time and we go to church 1 day a week to prepare for eternity. "Something just doesn't seem right about that." he said with furrowed brow. I agree, but just as I told Joshua, we have God's Word 24/7 and His Word is always preparing our hearts for eternity. We just need to be in His Word. How could we stay away from a "book" a "letter" that is living, that is active, that is sharp, that gives light, that penetrates deeply, that judges our thoughts and attitudes? God's Word does all that and more. How can we not read it cover to cover and again cover to cover and devour every morsel asking the Holy Spirit of God to divide our soul and spirit, joints and marrow and to transform our thought and the attitude of our heart? So I ask you, "Have you finished the bible?" As I told Joshua, you are never finished with the Bible. So grab your coffee and find a cozy chair and unfold His Word. The light and understanding are there.